Late and brief this time. I feel like my #1 weekly wish this week should be: do not sleep any more days away! Because I kind of slept right through Monday. I’m so sorry, world. I’m so sorry, me. 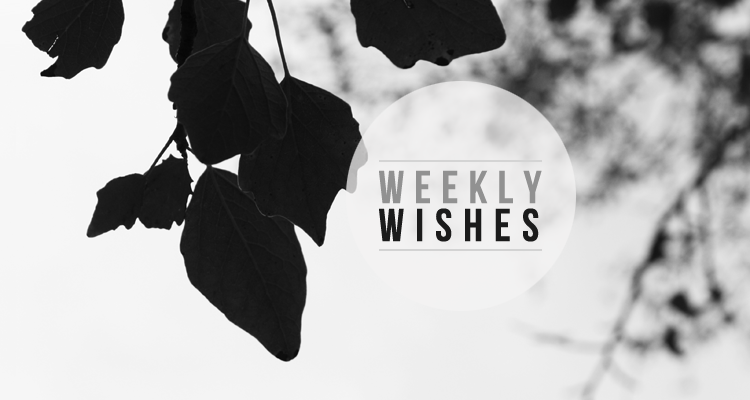 How I did on last week’s wishes: I blogged every day! I vlogged twice, too. I stretched on and off, which is something. But I totally failed at taking pictures regularly. I may not have taken a single shot. I am a disaster. But the weather’s getting better (read: cooler) and that can only mean good things for my productivity and general ability to behave like an adult human. 1. Keep up the daily blogging! I’ve been doing well, but I want to keep this as a daily wish another week or two, just in case. I’d like to put up a couple more videos this week (maybe one with singing! and guitar! I’m thinking one of the April Smith songs I know well, to start with), and I want to pick an outfit challenge to start in September (help me choose?). I’d also like to figure out how I’m going to approach the sponsorship thing going forward – it’s totally new to me and yeah, sidebar ads are easy enough, but there’s gotta be more than that! Need to think on that. 2. Make a big dent in my product photography to-do list. Super important! Exclamation point! 3. Work exercise into routine tasks. This occurred to me on Sunday and I started doing it right away. Basically, exercise – especially the little-bits way I do it – doesn’t have to be its own thing, and it’s easier for me to do if I integrate it into other tasks. I can do straddle stretching while I’m working on my laptop in bed; I can do the butterfly while I play with my iPod; I can stretch my knees while I wash my hair or wait for my coffee to heat up; I can do batches of dips when I walk in and out of my room (I put my hands on the footboard of my bed). So I’m going to try and do that. 4. Go to sleep before 2 AM. As to avoid, you know, yesterday. And all those times I’m awake at night and sleep in the day. I can’t force myself to get out of bed in the morning (I have a really hard time doing that, anyway) but I can make myself go to sleep at a decent hour. I am not an owl! Also, I like mornings. Also, I need daylight for most of my work. So let’s be awake during it. * I used my own referral code to sign up as lixhewettdesign – that means my first 40 listings there are free, and when the shop opens, I’ll get 40 free listings for my photography shop as well. I really, really want those so I can list more photos (like the ones I’ve used for Weekly Wishes art) and phone cases. I know listing fees are small, but they seem kind of scary when you’re as broke and lacking in a regular source of income as I am. You’ll notice that looks a lot like last week’s list – and that would be because it does. Still working on building back those good habits. Normalcy wasn’t built in a day, and all that. I did feel human again for a few brief moments last week, so there’s hope! What are your goals for this week? Go here to link them up! First, I love the clean look our your page. Every easy to read. Second if I didn’t personally try to pick different things each weekly wishes then I would always have Eat Better and Workout on my list. I don’t go to bed at 2am but I am also a night owl and have to force myself to go to sleep before 11 everynight. Back in college I was up all hours. Sometimes I miss those day, but it does make it harder to get up. Keep up the good work, blogging everyday can be a challenge but it will pay off. Thank you! I’m a writer above all (despite my current focus on photography and other visual arts) so I place a lot of importance on readability. 2 am is a good bedtime hour for me – I’d have a hard time going to bed before midnight because everyone’s up around that hour. (Spain at large works on a schedule that’s a bit different from the US/UK – 8 AM to midnight rather than 6 AM to 10 PM.) Lately I’ve been going to sleep after 4 AM, though, which goes well beyond ‘I feel productive at night’ and right into ‘choices that are terrible on every single level’ territory. good luck with your goals!! Sleep is always the hardest thing for me!! There is always so many things I want to do!! Thank you! Everything always seems a little more pressing when you’re about to be out for the count for a number of hours, doesn’t it? Haha. I totally agree with anything you said about sleeping..
great weekly wishes! blogging everyday can be tough to do but so worthwhile. good luck with sticking with all of your goals! I managed to go to sleep before 3 last night, which I’m super proud of, lol. Exactly! I agree on all points. I often miss the 9-11 AM period and it’s such a shame because it’s such a lovely time – it’s bright without being overwhelming, it’s quiet and peaceful, and I feel like the whole day is ahead of me.